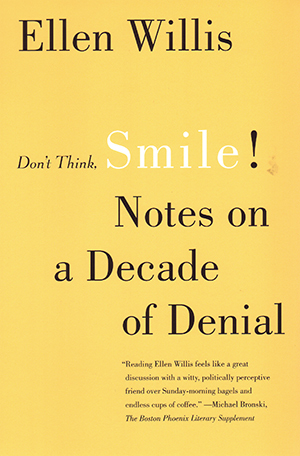 Beacon Press: Don't Think, Smile! If the 1970s were the “Me Decade,” and the ’80s were the years of the Reagan counterrevolution, then the ’90s, writes Ellen Willis, were the Decade of Denial. In keeping with the mass media’s glib assumption that a phenomenal increase in wealth for a minority meant genuine national prosperity, the 1990s saw an astounding refusal, on both the left and right, to question received wisdom or engage in substantive deliberation. Turning her acute eye to the decade’s defining moments-imbroglios like those surrounding the O. J. Simpson trial, The Bell Curve, Monica-gate, and the Million Man March-Ellen Willis reveals the mindlessness behind the noise. Arguing that we suffer from a lack of true freedom, she demands that we radically rethink our country and ourselves to create a society in which we can fully enjoy life.